1. The new BMW G 450 X arrives ready for action. 2. The new BMW G 450 X in detail. BMW Motorrad announces pricing for hot-shot G 450 X Sport Enduro. BMW Motorrad dealers across Australia are gearing up for the much-anticipated arrival of the all-new, highly-innovative and race-bred BMW G 450 X Sport Enduro. It's official. The new BMW G 650 Xcountry is a winner. BMW Motorrad Australia Adds New G 650 models. Building on the warm welcome Australians have given the new generation BMW G 650 Xchallenge in the past six months, BMW Motorrad Australia is delighted to announce that two further models will join the range. 1. The new BMW G 450 X. From the showroom floor to the start line. The New BMW G 650 Xchallenge. Very Trail Happy. First ever BMW Trail bike. The New BMW G 650 Xchallenge. In Detail. (Long Version). 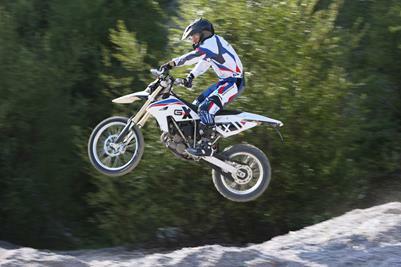 The new BMW G 650 Xchallenge is one of three models presented by BMW in Europe simultaneously last October. The other models, G 650 Xmoto and G 650 Xcountry are not offered in Australia. BMW G 650 Xchallenge. A New Direction. BMW Motorrad is saddled up and ready to hit the trails of Australia with the new G 650 Xchallenge. The New BMW G 650 Xchallenge. Engine Output and Torque. Serious trail bike a first for BMW. Light-weight, fast, with agile handling. Delivers BMW technology and innovation to a new market. BMW Motorrad is making a proud appearance at the 2006 INTERMOT Motorcycle Show in Cologne, Germany, with the widest and most varied model range in the history of the Company. BMW G 650 X Model Series - Range of Equipment. Sporting and emotional design characterised in particular by lightweight features. BMW G 650 X Model Series - Technical Basis. BMW G 650 X Model Series - Specific Model Components and Distinctions. 2010 BMW G 450 X.